This lovely perennial evergreen wildflower is one of three yellow sage-like plants that are native to Crete and some nearby countries. Plants (shrubs) of Phlomis cretica grow to around 50cm in height. Its leaves are quite distinctive: lanceolate to narrowly oblong, from 3 to 8cm long and velvety (tomentose), the tiny white surface hairs being more markedly dense on the undersides. The yellow flowers, which are up to 2.7cm long, are borne up the stems in well-spaced whorls of typically 15 to 25 individual flowers. 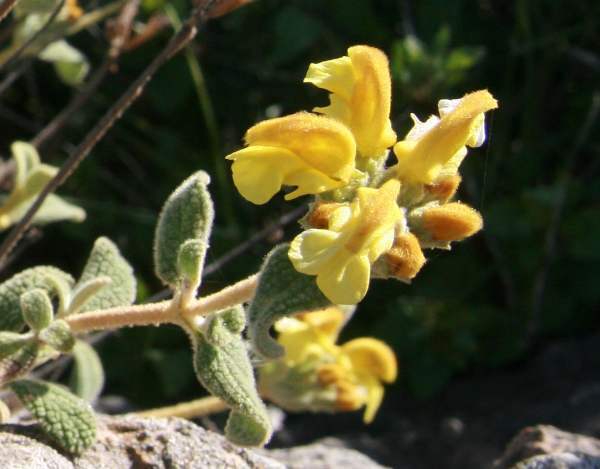 Although the leaves and flowers are rather sage-like in appearance, this species does not smell at all like sage. The natural range of Phlomis cretica covers parts of Crete, Greece and Turkey, but this attractive flower has been introduced to gardens throughout much of the temperate world including the UK and Ireland. 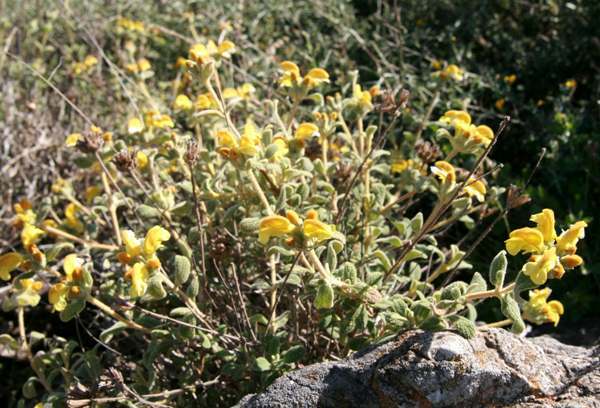 Cretan Jerusalem Sage grows in the habitat referred to in Greece as 'phrygana', a dry and stony limestone-based habitat referred to as garrigue in some parts of the Mediterranean. It is a member of the Lamiaceae (mint) family of plants. On the isle of Crete, Phlomis cretica is usually in flower from March until June. This wildflower grows in the habitat referred to in Greece as 'phrygana', a dry and stony habitat referred to as garrigue in other parts of the Mediterranean. It is a member of the Lamiaceae (mint) family of plants.